We all understand how crazy busy mornings can be especially during the holidays. How awesome would it be to wake up to a steaming bowl of Chocolate Oatmeal? We enjoy this several times a week, mixing it up with whatever fruit and nuts we have on hand. During the holidays I add dried cranberries for a seasonal flavor that our family and guests love. Add oatmeal, cinnamon, chocolate (or cocoa) maple syrup and coconut oil. Cover, and return to a slight boil for 1-2 minutes. 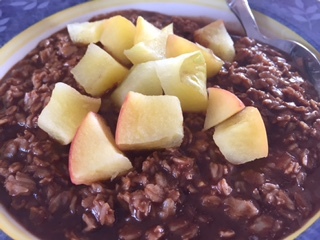 In the morning, heat the overnight oatmeal over medium heat, stirring occasionally for about 5 minutes or until heated through and no water remains. Add your fruit (if using) and cook over low heat until it softens.